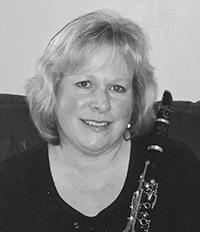 Music instructor and clarinetist Michelle Lucia-Ingle’s research on using software applications to learn, teach and play clarinet has taken her from the University of Florida’s online Master’s in Music Education program to the Thompson Symposium at Penn State University to the pages of the International Clarinet Association’s journal The Clarinet—and beyond. The journey for the 2014 graduate of the online Master of Music in Music Education (MMME) program began with a gentle prod from School of Music faculty. “They encouraged students to take advantage of extracurricular opportunities to learn and grow as musicians, scholars and educators,” Lucia-Ingle says. One of these opportunities was the Thompson Symposium, which in 2015 accepted her Capstone research for presentation at this biennial event. The Capstone is the culminating project in the online degree program. The Symposium, a juried forum for master’s degree music students, is named in honor of acclaimed music educator Keith Thompson, Ph.D., who retired from Penn State in 2003 and has been a part-time member of the faculty of the UF School of Music since 2012. Following graduation, Lucia-Ingle submitted her research to the International Clarinet Association’s (ICA) annual Research Competition. She not only made it to the finals at the association’s ClarinetFest 2015 in Madrid, Spain, she also took home the second-place prize of $500. This spring, the ICA published her work in its journal. These successes are a testament to Lucia-Ingle’s passion and persistence, the relevance of the program’s curriculum, and the resourcefulness for which music teachers are known. Just days after publication, she emailed MMME Program Director William Bauer, Ph.D., to share the news. “The faculty were so helpful and encouraging that I want to keep them in the loop,” Lucia-Ingle says. Lucia-Ingle credits the MMME program with expanding her knowledge of research methodology and new technology for teaching and learning music. “I had been in awe of technology before entering the program. I wasn’t afraid of it; I just didn’t know very much,” she says. The MMME alumna now is taking her research beyond the applied clarinet studio and expanding it to encompass more instruments and more music apps. Lucia-Ingle’s teaching career has also blossomed since she graduated from the University of Florida School of Music. Prior to earning her online degree, Lucia-Ingle taught clarinet at her private studio in Grand Forks, N.D. Now she also teaches Music Appreciation, World Music, Jazz History, and the History of Rock and Roll as an instructor at Northland College, across the state border in Minnesota. Even though she teaches on-campus, Lucia-Ingle incorporates many of the online learning tools she used as an MMME student into her courses. “I give my students a lot of work online. There are so many resources available, plus it requires them to take more personal responsibility for their education and be self-motivated,” she says. Lucia-Ingle knows something about self-motivation. In addition to conducting research and teaching, she performs as a clarinetist whenever time allows and opportunities arise. She has been a member of the Joyeux Chamber Ensemble and Baltimore Symphonic Band and a principal clarinetist of the High Desert Symphony and Greater Grand Forks Symphony Orchestra. She currently is studying Spanish music and has plans to earn her doctorate in music and teach at a university.